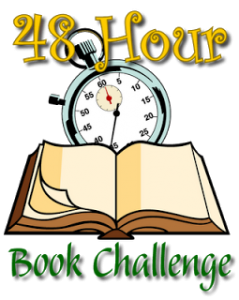 Are you ready for the Tenth Annual 48 Hour Book Challenge, starting tomorrow? Doesn’t this look absolutely yummy? Have you seen any of these books yet? What books are you going to read this weekend? Disclosures: All of these books are from the library. Also, I am an affiliate with Amazon so I can provide you with cover images and links to more information about books and products. As you probably are aware, if you click through the highlighted title link and purchase a product, I will receive a very small commission, at no extra cost to you. Any proceeds help defray the costs of hosting and maintaining this website. Another 48 hour book challenge has slipped by. I was able to read for 14 hours. I will be donating $25 to Reading Is Fundamental. The first book I read was Life: An Exploded Diagram by Mal Peet, which was one of the 2012 Boston Globe-Horn Book fiction honor books. I did finish it, but it wasn’t what I was in the mood for. It was too masculine for me. I will save my other snarky comments about phallic symbols to myself. I also finished The Hunger Games and Catching Fire by Suzanne Collins. As promised, the books were compelling reading and I couldn’t wait to find out what happened next. Before I read them, I have to admit that I had Shirley Jackson’s “The Lottery” in mind (horror/suspense isn’t my favorite genre) and I wasn’t sure I would like them. I enjoyed the first person voice and the no nonsense pace. I can see why they are so popular. Thank you to Mother Reader for keeping this going!